The verses of the Qur’an about the falling of rain and the place of water in our lives give us true information. If we were to live in another period of history, we would not be able to understand this information. Since the cyclic process of waters in the world has been exposed in detail nowadays, we can easily understand the information about waters in the verses of the Qur’an. When we compare the old information about waters and the related verses of the Qur’an, we see that the Qur’an presents the truest information about waters just like in any other subject without including the wrong information of the old ages. However, does this information which is well known for us can be known in any other ages of the history so clearly? Thales of Miletus explains the reason of the existence of underground waters as follows: the waters of the ocean that gushed out in the air by the pressure exerted by winds blowing from the depths of continents fell back down, penetrating the earth. That is, according to the Thales of Miletus; underground waters occur as a result of the overflowing of oceans due to winds. Plato shared this view and believed that its return to the ocean was caused by a huge whirlpool. Aristotle contended that the vapor that rose from the earth condensed in the cool recesses of mountains, forming subterranean lakes and spring waters that were fed by these lakes. Yes, these views that made you laugh belonged to philosophers who were the most intelligent people of their ages. 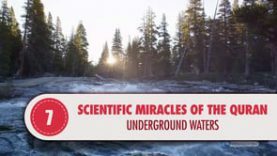 However, the Qur’an gives the information thatunderground waters form as a result of the penetration of rain water into the earthages ago, in a time when there were no science and techniques. The information of the Qur’an about the formation of the underground waters as a result of the penetration of rain water into the earth clearly stated 14 centuries ago was put forth in Europe in the 16th century and only at that time, they were able to oppose Aristotle. If the Qur’an is not accepted as the book of Allah after this information, how can the trueness of this news of the Qur’an be explained? How was this ecological information which could not be discovered by so many intelligent philosophers discovered by an illiterate person fourteen centuries ago? Attributing this information to the discovery of an illiterate person who lived at that age could only be possible by insanity. Then, the Qur’an is the word of Allah, who brings the water from skies and lets it be absorbed by the underground springs and informs us about this miraculous news 1400 years ago.